We had a great time this week. The three CTI students went to Dave’s house in Northern Ireland last weekend! He toured us around his hometown, a coastal town called Whitehead. It was beautiful. We walked along the Irish coast and came across caves and a lighthouse that looked stereotypical of a Northern Irish town. We went to his home church and had fellowship there. We went into Belfast and walked through the town and saw some great sites. They built a great outdoor mall where you can walk up all these steps to get a great view of the city. The best part was that we got to meet Dave’s awesome family. His father was a patriotic Ulsterman, who made me laugh on more than one occasion. Dave’s father and I had a great discussion about theology (he is a retired RP minister), and we also talked about the differences between American and European politics. We were up until three in the morning chatting about the different worldviews. It was great to hear the point of view from an someone who has been around the block and could tell me the European worldview. His mother was always trying to make us (Ryan and I) feel at home and tried to make us happy all the time by feeding us and providing for us. His brother was great as well. We played video games with him and had some great laughs with him. Also, this week we went to Stirling. You may have heard of this town because it was in Braveheart. Two great battles were fought there for Scotland’s freedom. We also went to the Wallace Monument. That was great fun. We had to walk 246 steps to get to the top of it. It had three levels to it though. Each level gave you more information about William Wallace and what he did. 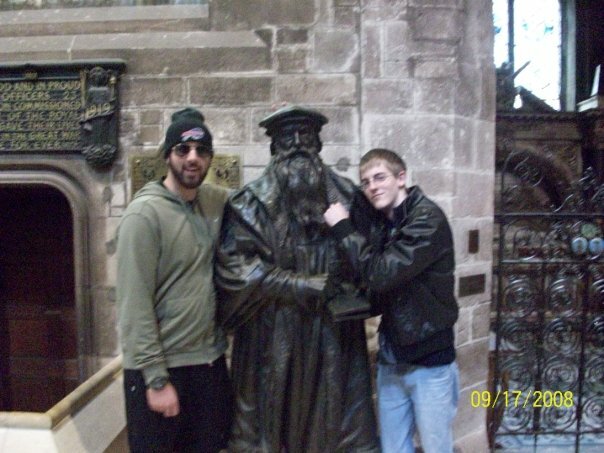 There was also in the Monument a hall of Scotland’s heroes, like John Knox and others. When you get up to the top you can see the whole city from up there. The sight is amazing. God’s creation is so great and beautiful. It doesn’t matter if you are in Northern Ireland, on top of the Wallace Monument, or in your home; God’s creation is so great and shows that God is the creator of the world. I’M BACK!! Hey blog readers, this is Ryan Dewey writing another CTI blog. You know a lot of people love their nation’s flag. I know a lot of Americans have the stars and stripes outside of their homes. I see it over here too. The Scots are very proud and patriotic about their country. The Northern Irish also love to see their flag hung up. Yet when I first got here, I didn’t think much about the Scottish flag. It was just a white X with a blue background. But that view quickly changed when I found out that X was the St. Andrew’s cross. Andrew was none other than one of the twelve apostles who followed Jesus. Now all of the apostles were martyred except for John. Andrew was crucified. But he refused to be crucified the way Jesus was. It shows us the respect and honour he had for the Lord. To him, Christ was going to be the only one who died on a crucifix shaped like a lowercase T. So Andrew died on an X shaped crucifix. So that is how the X became the St. Andrew’s cross. 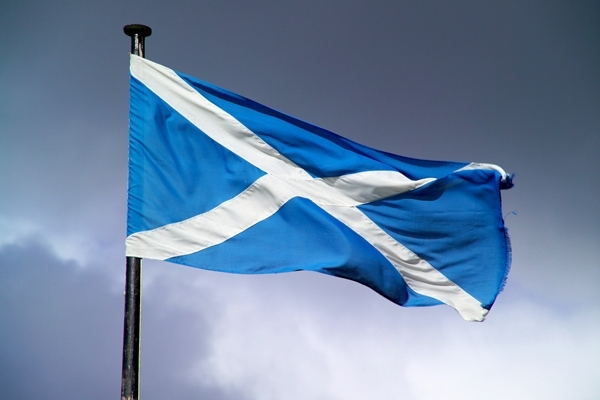 Why would Scotland have their flag be the St. Andrews cross? According to legend, in 832 A.D. King Angus led the Scots in battle against the Angles. King Angus and his men were surrounded and he prayed for deliverance. During the night Saint Andrew appeared to Angus and assured him of victory. On the following morning a white X against the background of a blue sky appeared to both sides. The Scots were heartened by this, but the Angles lost confidence and were defeated. This design has been the Scottish flag ever since. It’s a neat story, but I don’t think about that when I see the flag. I think of the Reformation that happened here, how the country was changed by God and His Word, how the whole nation made a covenant to God that they will serve him alone, and that He would be King over all. I also see martyrs for Christ, men and women who were willing to die for Christ and His Kingdom. The Scottish flag represents the power of God and His Word that brings salvation to many. and forgotten to its people. They don’t look at their flag the same way I do. Does this mean we should give up and say, “Well, the Reformers couldn’t keep their nations faithful for God forever, so I guess we shouldn’t even try?” Certainly not! It’s not our job to convert nations to God. That’s the Holy Spirit’s job. God calls us to teach and preach God’s Word and Gospel throughout the entire world. That’s what the Reformers did. Scotland into ambassadors for Christ. More importantly, I pray we will share the Gospel throughout the world, and never stop no matter success or failure because God gets the glory and uses us for His good. Rom 8:38-39 For I am persuaded, that neither death, nor life, nor angels, nor principalities, nor things present, nor things to come, nor powers, nor height, nor depth, nor any other creature, shall be able to separate us from the love of God, which is in Christ Jesus our Lord. It is a great comfort for us to realise that God is loving, and that His ear is never deaf to the call of His children. Spending time and fellowship with the congregation has been of great encouragement. Integration and fellowship among the saints here is one of the many important tasks that await the CTI students, and let’s face it, it should be the task for every Christian. I really fear that we can so often squander the minutes and the time that we have each Lord’s Day. The same old excuses and the same old events pop up. After the sermon we can so easily drift over to the same group of people and talk about the same old topics week after week. It is funny how simple things can be so difficult. Is it really too difficult to drift over to that certain someone in the church that we really feel we don’t have a lot in common with? John 13vs 34-35: A new commandment I give to you, that you love one another, just as I have loved you, you are also to love one another. By this all people will know that you are my disciples, if you have love for one another. How about the age difference? The Apostle Paul tells us that the Church consists of people in all stages of life. Young and old come together in the assembly to worship God. I can safely say that some of the most encouraging words that I have ever received in my Christian life have been from saints that are more advanced in years. Too often in churches and fellowships the youth groups are totally disconnected from the older members. Psalm 133 clearly states that it is in unity that we should dwell. I am glad to say that in the Airdrie congregation the after service fellowship is varied, and the younger members mingle with the older. However we all have a responsibility to reach across the aisle and talk to those brothers and sisters who are so often left out. Let us have open arms to the visitor to the church and a warm embrace to those whom Christ has purchased with His blood. 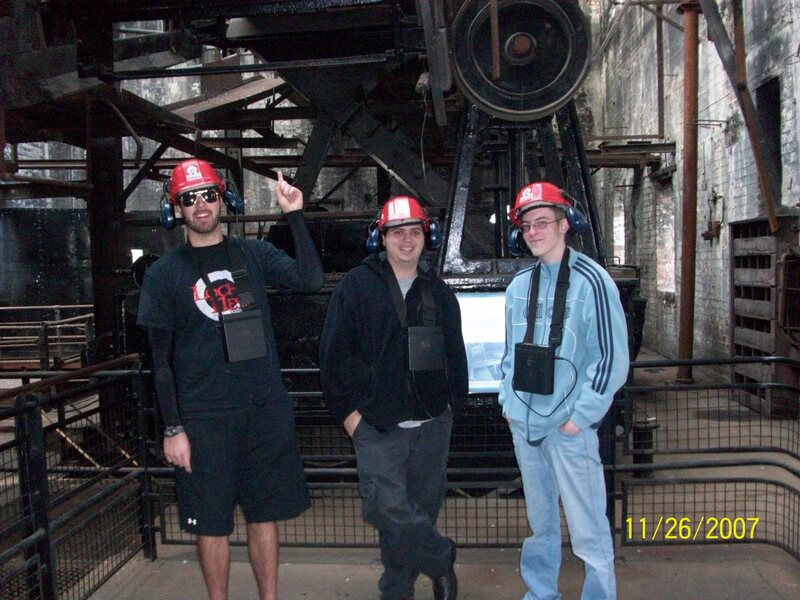 Last week CTI went to a coal mining museum. A member of the Church took us; his name was George. It was really coal (haha…play on words) to see how the working men of Scotland provided for their family. 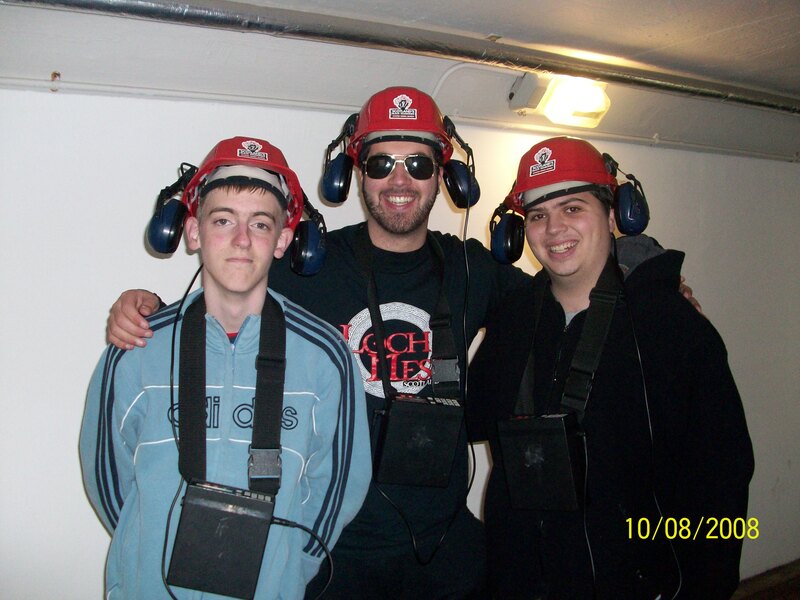 We went down in mock shafts to see what it was like, and it was really neat and cramped. It reminded me of home because western PA was huge into coal mining. It was a great time to have fun, learn some history, and learn about George. One of the most exciting things for me on our Wednesday trips is to learn more about the people who are in the congregation. I learned a lot about George, and his family, and how he came to Christ. He is a great man because he is a follower of Christ. After our trip to the museum we went to George’s house, and he and his wife fed all three of us until we couldn’t eat anymore! George and his wife are great, and so is everyone who attends the Airdrie Church. They treat us like family because they truly understand that we are all brothers and sisters in Christ no matter what part of the world we are from. Church family is important to the congregation, and it should be important to all of us. It is important to them because it is important to Christ. As a man who wants to go into the pastorate, I see how I would like my congregation to look if and whenever God blesses me with one. May God have the glory! Seeing this and reading the books that we are reading, I see myself growing and maturing. Lately, I have learned about worship in our reading; so often people say they will worship God how they want to worship him, even though God has told us how he wants to be worshiped. We do what is right in our own eyes, which in the Old Testament didn’t work out well. We are to worship God how He wants to be worshiped. Too often churches want to make the people happy, so the church compromises things in order to keep the people happy. Sadly, in America we have seen the compromising of the Gospel in order to keep people happy by doing away with hard teachings. The purpose of church is to worship God, how He wants to, not how we want to. We are sinful, and the way we want to worship God is faulty because we are sinful. It is hard enough to worship God the way He wants without our sin getting in the way, let alone denying how God wants to be worshiped and replacing it with the way we think God should be worshiped. The Gospel must be preached. The Gospel in short is: God created everything and man; man was to worship God; man turned his back on God and did what was right in his own eyes; God calls this sin and all men are sinful and spiritually dead in their sins and deserve hell; man has no hope in himself to be forgiven of his sin; God in His love sent Jesus Christ, a perfect representative because he was 100% God and 100% man, who then was sacrificed in our place; this sacrifice was the satisfying of God’s wrath against human sin; anyone who believes that Christ was and did these things may have eternal life because their sins are forgiven. This is the Gospel in short. Even though it is very basic, some churches have forgotten to preach the essentials and foundations of the Christian faith. They preach in order to make people feel good and happy about themselves…this is not the Gospel. God has a wrath that must be satisfied. If you do not believe in Jesus Christ and the things that He is and has done God’s wrath will fall on you. Amen. Guten Tag all you blog readers. This is the one and only Ryan Dewey writing his second blog for the CTI program. This whole week we took a break from our books and drove all over Scotland to see sites that dealt with the Scottish Reformation. For those who don’t know, the Scottish Reformation officially started in 1560, although there were events that led up to it before hand. The unique thing about the Scottish Reformation is there are actually two reformations. The 1560 date, and then another reformation which happened in 1638. Both relate to each other, yet both are different too. I could spend many paragraphs and pages on the historical events, but I really want to focus on the main themes and why the reformations happened. If you want to know what the 1560 Reformation was all about you just need to look at the rest of Europe at this time. The Catholic Church was the church at that time, but sadly they strayed from the Word of God and became corrupt. Not only in Scotland, but men and women throughout Europe were raised up by God to fight the heresies of the Catholic Church. The 1560 Reformation was focused on teaching people the truth of Scripture and destroying the lies of the Catholic Church. Men like John Knox, Patrick Hamilton, George Wishart, and Andrew Melville preached justification through faith alone. They taught the common people of that time the authority of the Scripture and that Christ is Lord over all. The 1638 Reformation in Scotland wasn’t worried about the Catholic Church anymore. The Protestants won that battle. This Reformation was about who was truly King of all. At that time the UK was ruled by corrupt kings who believed they had a divine right to tell people and Church how to worship, live, etc. The reformers of Scotland, or the Covenanters as they were called, knew that Scripture taught the true King was Christ, and the UK king had no right to tell the Church what to do. The Church is the bride of Christ and submits only to her husband. Eventually, the Covenanters fought for this and won by the help of the Dutch. This paragraph is just a brief, and I mean brief, description. This topic is vast, and I encourage all of you to read more about the Scottish Reformation. During this time many Covenanters were killed by their own countrymen. And it wasn’t just in military battles, but some were killed while praying or reading their Bibles. This time in history was very bloody. The Covenanters were viewed as terrorists. So why did these men and women die? Was it because they hated the monarchy and wanted a new government? Or was it because they were too stubborn and just couldn’t get along with other Christians? Or was it because they were fighting for religious freedoms and liberties for all peoples? It was none of these things. As I have seen in the gravestones of many of the martyrs, the writings on the stone tell me the truth. They did this in adherence with God’s Word. They did this in the defense of the Gospel which brings salvation to many. These men and women died because they lived for Christ instead of man, traditions, or any authority apart from God Himself. They trusted in the Scriptures and knew the words were from the one and only true God of the Universe. They sought for things above and not earthly things. They were truly children of God. I pray that God will continue to form his Church like Christ, so that we can have the faith and spiritual strength the Covenanters had. A great comfort for the Christian is to remember that the Lord not only has plans for us, but that He also has plans for the next generation. We can smile and remember that the Lord’s plans do not simply end when we pass on to heaven, but that He has already laid out His plans for the Christians that will follow in the years to come. Isaiah 40 vs.11, reads, He will feed His flock like a Shepherd, He will gather the lambs with His arm, and carry them in His bosom and gently lead those with young. The Lord looks down on His children and as members of His flock we are sure that His hand with be there to comfort and to nurture us. As the child seeks help and love from its parents, so we can also turn to our Father the shepherd of our soul. The CTI course requires us to be active among the life of the church, this means that we have to knuckle down and get involved in the church’s activities. I am helping out with the Covenant Kids Club on Fridays. It has been a great encouragement to see how active and how dedicated the teenagers of the congregation are in terms of their dedication to the Club. The young people are willing to lay aside their free time to meet, discuss, and prepare the organisation of the Kids Club. I exhort all who read this blog to remember to pray for these teenagers, thanking God for His work in their lives and also to strengthen them to deal with the difficulties in their lives. Also give thanks for the faithful attendance of the children who come to the Club, pray that they will hear and obey. Our lectures and studies continue, and we are steadily making our way through the books, the chapters are getting bigger, but God provides us with all the aid we need! The CTI team had another cracking day trip with Graham (The Legend) Russell. After the previous week we were hesitant to think that Graham could top the day trip to the Scottish Parliament and Edinburgh, but somehow he managed to do it! We visited Culross, a small village that has pretty much remained the same for about 400 years, it really did feel as if we had been transported back in time – maybe Graham’s car really is the Tardis! We also got to see some of the set and film crew who were filming a remake of The 39 Steps and some lovely vintage cars! (Graham knew what he was doing!). We then visited the Forth Railway Bridge, an incredible bridge that really was an impressive sight to see! Dunfermline Abbey was the next spot on the journey! We had a nice stroll around the park and had some great laughs watching the squirrels going crazy for the peanuts that Graham had brought. Inside we were able to see where Robert the Bruce was buried. I had learnt about him in school, and I found it hard to think that I was standing at his grave. Linlithgow Palace was hit next by the team and Graham ever ready with his wisdom, was able to fill us in on the history of the building, giving us details about who had stayed there and the area surrounding the palace. It was impressive to think of the lives , the people and the changes that had happened in Scotland in such a short period of time. It really is interesting to think that God’s plan and His Hand was getting the land ready for the Reformation. You would think that Graham would give us a rest from this awesome tour of Scotland’s finest historical and national treasures, but he had one more treasure to show us! His sweet collection of wedding cars, the cars were superb! These cars were fantastic looking and for once I envied the married man! The day was brilliant as throughout the day we were able to get some terrific fellowship, and we had plenty of laughs! 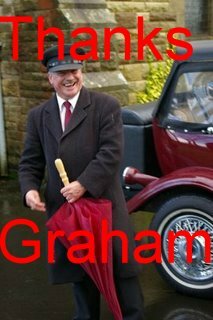 One thing Graham knows how to do is entertain! Learning and growing through experiencing life in another culture, and through interaction within a church that Christ is building into a living, dynamic body.